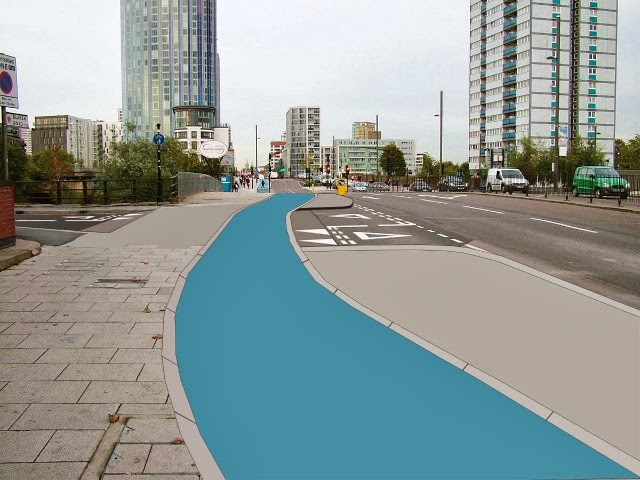 A view from the cycle path: Has London progressed in the last six years ? It never ceases to amaze me how UK road designers are unable to use the ready-made tried-and-tested infrastructure designs that have been developed in the Netherlands. I understand a bit of "not invented here" syndrome, and the slight complications of differences in highway laws, but surely the TfL designers could have used the best Dutch designs for the bus stop bypasses without any trouble, and, in the process, gained glowing reviews all round. I think the root cause is that "we" (our leaders) don't actually want more people cycling in the UK. "We" are forced to make the right noises about sustainable transport and improving road safety, but "we" really want to be able to drive "our" cars without any restrictions (other than the carefully-ignored problem that everyone else gets in the way by driving their cars at the same time!). Perhaps "we" think that cycling is still a left-wing activity, so unacceptable in such a right-wing rules country (both Tories and New Labour). The UK needs a "Stop the Road Murder" movement, and soon, before the country suffers too many completely avoidable deaths to fit and healthy people just trying to get to places. David, if your constitution can bear it, I hope you can visit London again soon. 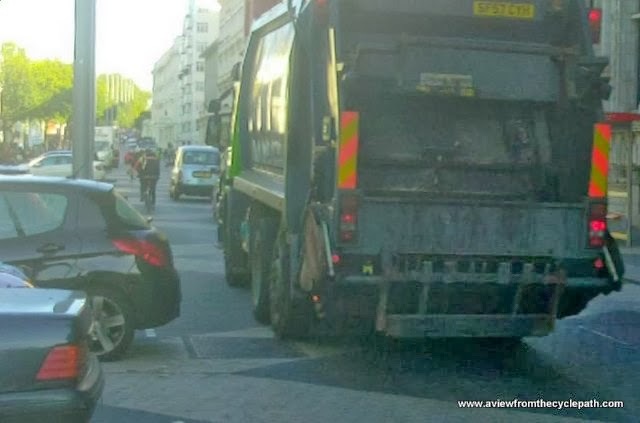 It has inspired you to write very a very passionate, no holds barred, polemic which is exactly what's been needed after this unfortunate week on London's roads. Next time go with a bit more fanfare & go and bend some ears! The one thing that's troubled me most about cycling since coming back to live in the UK, more than congestion, pollution, bad road design and maintenance, and abysmally poor cycling infrastructure is the uncompromisingly brutalising attitude of large parts of the media, politicians and (as a result I'd say) a significant fraction of UK motorists, toward bicycle riders. Accordingly you get the "indicator species" of sad kids desperate for attention or bonding tweeting pathetic stuff about hating cyclists who should get out of their way etc. Not something to be proud of and it seems to me to be unique in it's antagonistic ferocity over a wide demographic at least in Western Europe. In this light, I was particularly struck by the "London is Slow" section. It's a number of years since we lived in the Netherlands & I'd forgotten about that factor, but it's right. It's not just London, it applies to most town/city centres. The section made me realise that I've unconsciously chosen some of my regular routes, not to avoid traffic per se, but to avoid traffic lights. Many light systems (I'm actually thinking of the Epsom mini-gyratory) seem to operate on a negative green gulf. When one lot goes green the next lot in front goes red. No wonder UK drivers get impatient. The start-stop also contributes to the poor air quality, of course. At least a bike rider can filter to the front and make a little bit of progress. But seeing riders doing this just winds drivers up further. Drivers are of course encouraged left right and centre to keep to their oh-so-wonderful cars. They are, to my mind having to cope with the cognitive dissonance between what they are fed and what the reality is. It hard to say who is being failed the most, bicycle riders or motorists. However, it doesn't say much for the drivers that they are conned by this fallacy, and don't take to the bicycle in numbers. The media and politicians even try to boil safety down to issues of behaviour, conveniently ignoring (or more likely deflecting the point) that the environment to a large extent produces that behaviour, and that they create that environment. Change the environment to more people-friendly and safety (and to a large extent decent personal behaviour) follows. And I don't just mean the physical environment of infrastructure - it should include much more overt encouragement of bicycle use by officialdom, but there, I fear, fonant is largely correct. Courtesy of the poor quality, obsolete infrastructure in London and the rest of the UK, a sixth London cyclist in two weeks is now dead. 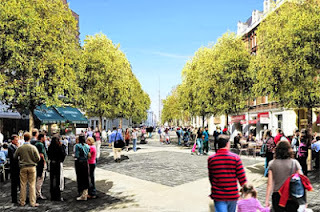 Boris' conscience must be as asbestos-lined as his attitude to cycling London gyratory systems. 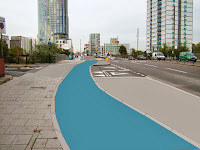 And for those unfamiliar with the deadly CS2, The Guardian have provided a study tour. Some of the principles are genuinely good. The idea of bus stop bypasses is no problem at all, it is just that you have to have high standards for them. Don't oppose the bypasses or the cycle tracks, oppose inadequate cycle tracks. 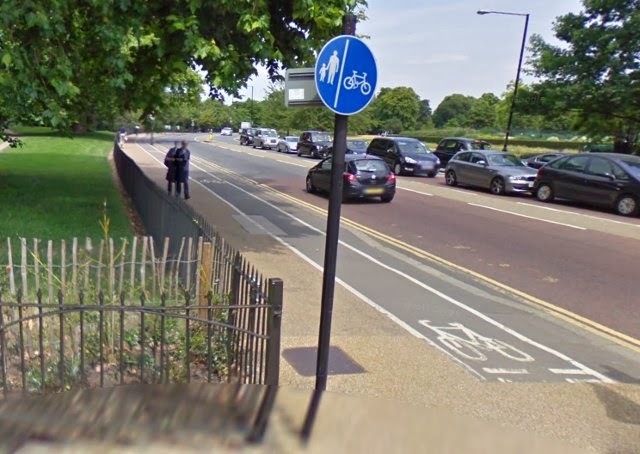 If the cycle track on CS2 had splay curbs, as in the angled ones, at 30-45 degrees, was wider by about 50 cm, widened the median between track and roadway, modified the minor side streets with gateway accesses (that deserves a blog post in and of themselves), made sure there was no sharp curves with the bus stop bypasses, made it so the raise in the cycle track was not so steep and less of a bump, and edited the junctions to either simultaneous green or protected junction, preferably the former (except at Bow roundabout where having separate signal stages with filter arrows should be sufficient), then London would have very nice cycle tracks. London is using splay curbs now, and they are beginning to realize that separate signal stages at traffic lights is practical, and keeping the cycle track wide through bus stop bypasses is beginning to get done. But I do have to say the progress is slow, many of the small details are bad, especially with waiting in the junction for a right turn, that you must wait to turn left on a red light, even though the LCC's better junctions campaign, as bad as they are, the only good thing aside from separate signal stages is the bicycle only slip lane, the fact that cyclists still have to wait behind puffin crossings where a zebra would suffice, at least for pedestrians crossing the track, and absolute width is still often a bit narrow. London, you are getting better with your trial and error, unfortunately, many of your designs are errors. I told Vancouver, the city, a few months ago about their bikeshare idea. I told them to use the OV Fietsen models rather than the traditional BIXI based models, as the gearing was better, actually there weren't gears at all (although thinking about Vancouver in particular, it is rather hilly so at least 3 gears would be nice), the chain was enclosed, the lights were bright, there was an included lock that couldn't be lost (well, the key can, but then the bike would be locked anyway), the rear rack is even good enough to allow a passenger to ride one, a bunch of featues that the Boris bike model just doesn't provide, especially in terms of maintenance. Another example of how helmet laws can really screw things up is that even though Vancouver knows that their segregated cycle lanes are good at creating subjective safety, they even have a protected junction designed like how Nick Falbo envisioned, and their fietsstraaten, well, rather basic bike boulevards, are direct, 30 km/h and have low volumes and are an asset to the cycling they have, helmets are still required, thus, they have the complication of providing them, like Sydney Australia. The Dutch don't have this complication. Neither does Britain, but it's still encouraged. Some back streets can feel quite safe if they are low volume and low speed, and the new EW and NS cycle superhighways are fantastic for subjective safety on those specific corridors, but most other places feel like helmets are actually an asset to people in their minds.